Caring for babies is hard! It’s amazing that we all manage to cope with it so well. And caring for newborn twins is double the trouble. But luckily, there’s a lot of good information, tips and tricks that you can use to make it so much simpler, for both you and your babies. In this post we explain how to feed twins by yourself. Breastfeeding twins is much harder than breastfeeding a single baby. But the technique for each individual child is actually exactly the same as for a singleton. You’re going to want to practice breastfeeding each baby until you’re sure that they’re comfortable latching on, and you’re comfortable feeding them. It’s highly recommended that you’ve made sure that your feeding procedure is normal before you actually leave hospital. Some mothers keep each baby on a single breast, but this can lead to your breasts looking and feeling different if your babies have different appetites. Other moms swap their babies over whenever they do a new feed. Feed each twin whenever they want or need feeding. Feed your twins on a strict timetable, ignoring their cues. Whilst this sounds harsh, it can actually be essential if your twins were very premature or are smaller than average. If you are going this route, make sure you check your schedule with your health visitor to make sure they’re going to be fed enough. Feed your twins whenever one wakes up. Once that twin is fed, wake the other up for a feed. Feed your twins together. If one wakes up, wake them both up and feed them together. The needs of you and your twins are unique, so I wouldn’t think to tell you the best way to feed your twins, but I do know that feeding twins together is the most difficult method, but can also be the most rewarding. This makes the whole aspect of feeding so much easier, from start to finish. When your twins are on the same schedule, it helps both them, and you. But getting there can be surprisingly hard. For your babies, the sight of the other can be calming, and getting into a routine helps both of your babies get used to the idea of feeding around each other. For you, being able to feed your twins together can free up a lot of time, allows you to keep an eye on both twins together, and once you get the method down, it can be surprisingly simple! One baby under each arm almost sitting up, or the rugby hold. One baby in the normal feeding position, lying almost flat, the other baby lying alongside them, further around. Getting your twins into a comfortable feeding position can also be difficult, especially if you’ve never thought about how to hold twins. We recommend the ‘kitten hold,’ where you grab your baby by the back of their babygro, using your arm to support them, and lift them straight upwards. If you find yourself struggling, you can also buy feeding pillows to help support your babies whilst you feed. These are specific V shaped pillows you can actually buy just for this purpose! 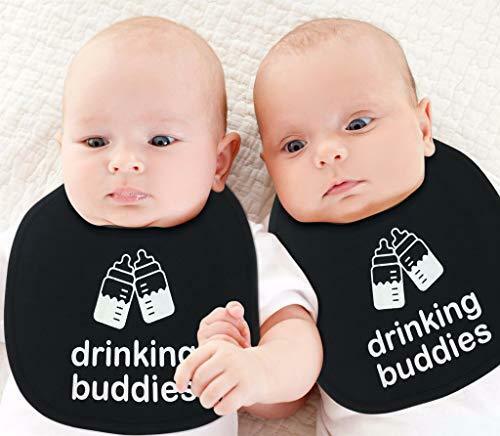 Bottle feeding your twins has its own set of issues. It’s much simpler in some ways, because anyone can prepare formula and feed your twins for you, allowing daddy to get involved and it’ll help him feel closer to his children. But formula can be expensive and obviously with twins you’ll be facing double the costs! Put both twins in their car seats, both facing you and slightly towards each other so they can see each other, then either feed them both together or feed one at a time. Sit between both twins, propping them up against pillows or against you, and feed them both. Share the duties. Give one twin to your partner, mother or another helper, and feed them both together. This is so much easier than having to learn how to handle twins alone. Remember to switch who has each twin between feeds! As long as you get a daily routine going, and get your twins used to the feeding routine that’s best for them and you, then you’ll get the hang of this soon enough. Did you know we have our own community for parents of twins? Join free today and join in the discussion. Do you have any tips or tricks on how to feed twins by yourself? What worked best for you, and what’s the most important thing that first time mothers of twins know? If you learned anything in the first few months of looking after your twins, we’d love to know about it, so please share it all in the comments!